Risi Kapital: Frugality: Welcome Challenge or Only a Chore? Frugality: Welcome Challenge or Only a Chore? This article is from new staff writer Kristin Wong. 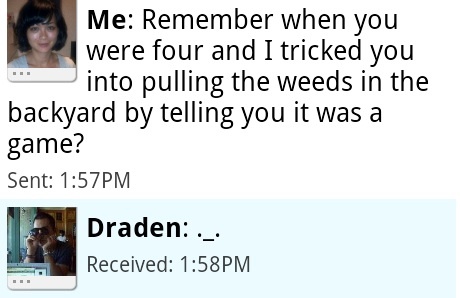 As a kid, it was my job to pull the weeds in our embarrassingly overgrown backyard. No, my parents didn’t believe in doing or paying for yard work. They had children, after all. The little knucklehead fell for it, and before I knew it, he was in the backyard–toiling, sweating and having the time of his life. Pretty soon, I didn’t even have to ask; he just wanted to go play his “game.” What I perceived to be miserable, he thought was a blast. Lately I’ve realized that I’ve sort of done the same thing with frugality. To many people, frugality is not fun. It’s boring and limiting and headache-inducing. Living a frugal life was never something that sounded appealing to me, either. It was never something I thought I would voluntarily do–maybe because, growing up, my family had no choice but to be frugal. Actually, we didn’t call it frugal; we called it poor. But at some point, I seem to have tricked myself into enjoying it. Don’t get me wrong; I still very much have to be careful with my spending. But I now perceive thriftiness as something fun, enjoyable, and dare I say–exciting? Okay, maybe exciting is pushing it. The point is, I don’t see my frugality having an expiration date, because it’s truly become a hobby for me. First, here are some ways I’ve been enjoying frugality–pulling the weeds, if you will. When it comes to topics couples argue about, money tops the list. So there’s no denying that frugality can be a romance buzzkill. Unavoidable, yes, but a buzzkill nonetheless. But I have a fun way to use it to my relationship’s advantage. Every now and then, my boyfriend and I will make a weekend outing to the mall or some other shopping mecca–a flea market, maybe–and we’ll play a little game. We’ll agree to go pick out a gift for each other that’s less than five dollars. We split up, hunt, and then meet back up later, when we surprise each other with the small but sweet, inexpensive present. Sometimes it’s a gag gift, and we get a laugh out of it. Yes, it’s silly and simple, but it’s still a pretty romantic way to spend some time. The activity forces you to think about the other person–things they like, their hobbies, etc.–so it’s a great way to remember the little things you love about your partner. It also helps you to reconnect, if even just a little. And it’s fun! And even though you are doing something inexpensive, the focus is not on frugality; it’s about being romantic and having a good time. It also makes an otherwise boring place kind of fun. When traveling, my boyfriend and I once decided to have a drink at a swanky bar, having no idea it was happy hour. We ended up ordering some fancy food, along with our drinks, and we walked out of the door for less than twenty dollars. That savings gave me an even better buzz than the wine I’d just guzzled down. During the rest of the trip, I was intent on beating that amount. I never really did, but I had a good time trying. Like my little brother, I’d managed to turned a chore into something fun. (Maybe I’m crazy, but the money-saving meals seemed to taste a little better, too.) Sometimes stumbling into frugal behavior is such a nice surprise, it inspires you to keep being frugal–if only to get that savings buzz back! It’s all in good fun, especially if you like crunching numbers and stuff, and, oh right–I happen to be saving money in the meantime! Okay, this one isn’t about me. It’s about someone I used to work for who happened to be quite thrifty. During college, I was an assistant to a small business owner–let’s call him Horatio. Horatio was rich. He was undoubtedly on a high, six-figure income, but he still drove a beat up old Ford and didn’t care a whit for country club memberships, name brands, or anything of the sort. We’ve all heard the story about the millionaire who didn’t behave like a millionaire–well, that was Horatio. Anyway, even though he was loaded, Horatio decided he wanted to have a second business. He started an eBay store, reselling stuff he found at government auctions. He raked in a small second income doing this, but it wasn’t like he needed the money. It was just fun for him–not the work, really, but seeing the rise in value of something he was selling in those online auctions–he really dug that. I should mention, Horatio was also incredibly generous, so I don’t think it was an obsession with greed that was motivating him. I used to consider frugality a lifestyle, but lately, it’s become a hobby, too. It’s no longer a chore, or something I merely have to do–it’s a game, something I also enjoy doing. Surely if I’ve “tricked” myself into thinking thriftiness is fun, others can, too. I suppose part of the trick is using frugality to appeal to things you already enjoy–romance or competition, for example. This way, instead of dreading it, it becomes something you look forward to. How Long Will You Stick With Your Frugality? I’ve been told the key to accumulating wealth is to live below your means, but what does that mean for those of us who prefer to have a low-key lifestyle? For those of you who are already having fun with frugality, when will you give it up? Certainly I would find it silly if my brother were still pulling weeds for fun, but I’m just not sure if I’ll ever abandon thriftiness, regardless of my financial status. Is frugality something you plan on sticking with for the rest of your life–or as your GRS journey ends, do you plan on giving it up (and then living it up)?